CM Magazine: First Days: Night Movies. Alison Uitti. Illustrated by Linda Wood. Saskatoon, SK: Hear My Heart Books (hearmyheartbooks.ca), 2010. Suddenly, the teacher is beside me. I hear her say my name and the train in my stomach jumps off the tracks and crashes down a mountain. I look at her and she is looking right at me. Her eyes are clear and brown and very kind. My tears feel hot on my face. My head is full of words. "Now I will not pass. I do not know anything. What will my sister say? What will happen to me? Will Emily still be my friend? The teacher will not like me anymore....."
First Days: Night Movies is one of the resource materials produced by Hear My Heart Books, Inc. Referred to as crisis management tools for children, these resources aim to empower all young readers, not exclusively those living in difficult circumstances. Author Alison Uitti, an elementary school teacher who has written stories, poems and songs for children, creates an engaging novella that traces a series of everyday events in a child's life. But these events are not everyday experiences for the main character. Uitti skilfully provides a first person account filled with the thoughts and emotions of a young newcomer dealing with unfamiliar cultural traditions, limited language, new friends and bullies, as well as difficult memories. The gentle tone of the narration enables the reader to empathize with the main character, who, interestingly, is not named. The term 'Night Movies' refers to both the traumatic memories of the past and the new memories created in the present. The nine short chapters of the book recount daily events or childhood experiences, such as lunch at school, a birthday party, new mittens, playing with a friend, cheating on a test or being teased and bullied. The inclusion of an assembly celebrating National Aboriginal Day on June 21st is a highlight and turning point for the young newcomer as she connects with the cultural richness and differences shared in the celebration. First Days: Night Movies reveals the physical and emotional distress that a newcomer feels in an unfamiliar environment but also emphasizes the joy and excitement of new friends, a kind teacher, caring adults and new experiences. The text, itself, may present a challenge to beginner readers, especially for EAL and ESL students, but, as a read aloud or instructional text, the vocabulary and easy flowing dialogue is age appropriate. The novella style will also appeal to slightly older children. First Days: Night Movies provides an opportunity for discussion about being a friend to a newcomer, handling problems at school and on the playground, and the difficulties that arise when learning a new language. 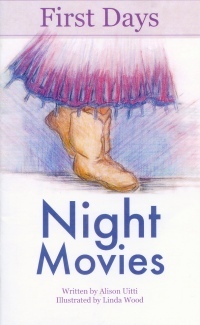 First Days: Night Movies is an excellent resource for all students to read and discuss in order to develop a better understanding of the need for a sense of community that welcomes newcomers and acknowledges the challenges they face and the gifts they have to offer. Janice Foster is a retired teacher and teacher librarian in Winnipeg, MB.